In making the wide circuit back to my office after running an errand on the other side of campus, I decided to swing through Red Arrow Park to pick up a sandwich for lunch at Starbucks. 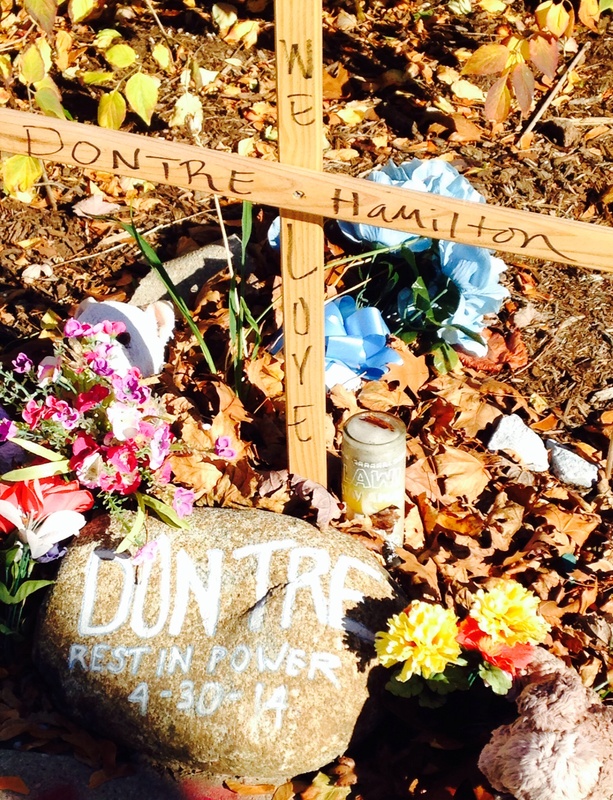 Over a year since a memorial to honor Dontre Hamilton was first proposed for the place where he was slain by a Milwaukee police officer (with little official attention since then, possibly because no one wanted to deal with it? 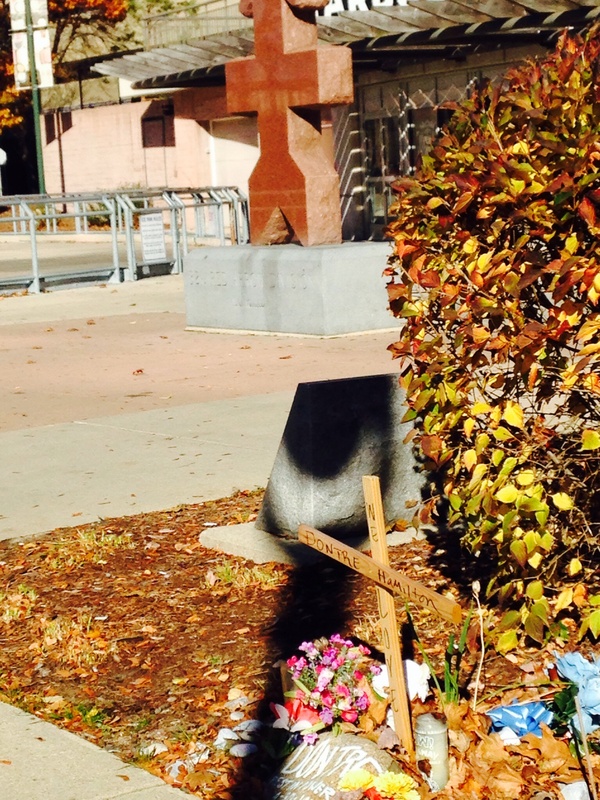 ), someone has gone ahead and created a memorial anyway without waiting for the wheels of government to turn. Although I’m sure the official position is that no one should be permitted create a memorial in a public park on their own initiative without going through proper channels, perhaps the county can unofficially sanction this homegrown memorial by leaving it alone. This entry was posted in History, Life, Milwaukee, News and tagged Dontre Hamilton, Downtown Milwaukee, Milwaukee, Red Arrow Park, Red Arrow shooting, unofficial memorial. Bookmark the permalink. The second photograph is a powerful story-telling image with the contrast between the homemade cross and the 32nd “Red Arrow” Infantry Division memorial. Nicely done! Thank you! I saw on the morning news that the Christmas tree was cut down up on Teutonia and is probably being installed in Red Arrow right now this morning. Plenty of activity there between today and Nivember 19 (tree lighting), so it’ll be interesting to see if the memorial can withstand the increased scrutiny associated with the extra foot traffic.